When you move to a new area, and want to get out and about, it's not uncommon to spend time studying maps of the area. Over the last couple of years we've done quite a lot of this, and discovered some unexpectedly enchanting walks. Sometimes it is just the unusual name that provokes interest, and the local villages hereabouts have names straight out of a Dickens novel - Goadby Marwood, Carlton Scroop, Scott Willoughby, Mavis Enderby and so-on. 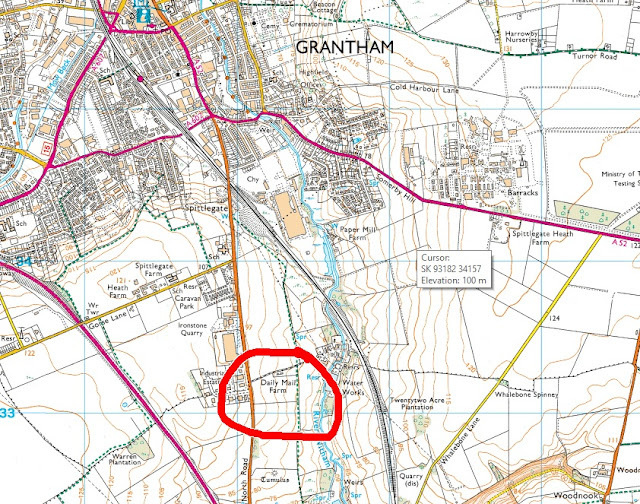 However, the most intriguing that I have seen recently appeared on the 1:25000 OS map of Grantham (OS Explorer 247). Just south of the town is a most peculiarly named farm. "Daily Mail Farm". Now, far as I know, the Daily Mail has no agricultural interests, and nor could I see why anyone would would name their farm after a national newspaper. Surely, I thought, there must be a story here. And so there is. It's a story of aspiration, luck, achievement and ultimately tragedy. This is the story of the Daily Mail Farm. The winner was Grimsby office worker George Pougher. The story below was culled from the archives of the Grantham Journal, as told by his grandson, John Pinchbeck. George was a 31-year-old clerk in Grimsby's dock office. Although born and bred in the Humberside fishing town, in his heart he was a countryman. Early every morning, George pushed his wheelbarrow through the gaslit streets and along the cobbled alleyways to his 'farm' created from an assortment of back gardens, courtesy of grateful fishermen who had no desire to maintain their narrow plots during their few days in port. Their wives received fresh vegetables as rent. In George's own backyard stood a greenhouse. Two streets away hemmed in between two man-high walls, was a cold frame with tomatoes. Further down the passageway was a shed with pigs, from which George cured his own hams. Other sites produced potatoes, cabbages or root crops for the rents, or to be sold in wife Annie's shop. George often dreamed of owning his own smallholding but with seven children there seemed little prospect of this becoming a reality. One morning in January 1907 an article in the Daily Mail caught his eye. The owner of the paper, Lord Northcliffe, had decided to put to the test whether the pioneer spirit which had caused men to carve a self-sufficient living in his native Canada, could equally apply in England. 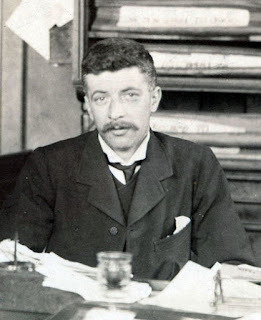 He had built The Daily Mail Farm on a 14-acre site just south of Grantham – prime arable land, room for five beasts, several pigs, lots of poultry – and would run a competition for the tenancy. The competition sought a tenant not necessarily with farming experience, nor physical strength, but with "a gift for trade and a good knowledge for animals." George entered – one of thousands of hopefuls. About nine months elapsed and George had forgotten all about the competition when the letter arrived. "Congratulations. You have won a three-year tenancy of the Daily Mail Farm at Little Ponton, near Grantham, with effect from Lady Day 1908. Details will follow – Northcliffe." Lady Day was only a few weeks away but that didn't matter. Within two weeks George had given up his job and Annie sold the shop. With their remaining possessions – including the wheelbarrow – George, Annie and five of their children travelled by train to Grantham and then by cart to the farm. This was a new life. Little Ponton was the promised land. In reality, this dream was sheer hard work. The whole family had to work hard. They made a good living, though not a fortune, and the public was kept in touch with his progress through regular articles in the Daily Mail. Lord Northcliffe visited the farm several times and was noted for his generosity to the farmer's young children. At the end of the promised three years, George took the leasehold of the farm. But then tragedy struck. George had been troubled with headaches for six months but they got worse and within months he died from a cerebral tumour. He was 34. 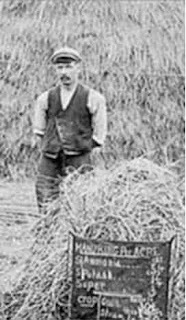 Annie and the younger children toiled for a year to retain the farm as a monument to this remarkable man, but none of the sons had inherited his farming ambitions. Eventually, Annie was forced to sell up and took her family to Commercial Road in Grantham where she ran a bed and breakfast for actors visiting the Theatre Royal in George Street. She died in 1945. One son had died in the Great War, and only the daughters had families. There was no one to carry on the name of George Pougher, who may have only travelled 60 miles but was a real pioneer. This is a fabulous blog post. Like you, I'm fascinated by place names (you've mentioned a couple of great ones in Tweets over recent months). Many evoke thoughts of bye-gone times and I like to reflect on the great sense of continuity many of them suggest. The story of George and the farm is lovely, apart from the sad ending. Thank you for taking the trouble to write it up.